On October 20, at only 14 years of age, Deangelo “Dee Dee” Parham suddenly passed of an enlarged heart. Although he lived in Los Angeles, he was in Alabama at the time of his passing; his death was felt miles away as the community of mourners came out to Rancho Cienega Sports Complex, in South Los Angeles, to pay their final respects and share in the loss of a great friend. Dee Dee was the younger brother of Antonio Chatman and Tony Parham, local kids, who made names for themselves as elite athletes at Rancho, Dorsey High school and beyond. Dee Dee was the youngest family member following in his big brother’s legacy. 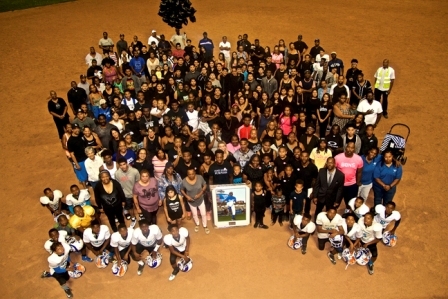 He was very much loved by his high school friends, park community and family. Kamani Black, deputy, Los Angeles City Council, spoke of his fond memories of Dee Dee and read a heartfelt letter, sent from the Dodger organization. “We are incredibly saddened to hear of the sudden death of Deangelo … we are honored to call him a member of the Dodgers Foundation family and are grateful baseball placed so much joy in his heart, Kamani read. He then shared with the audience that the Dodger Foundation was providing a donation of $2,500 in hopes of assisting with the family’s funeral expenses. 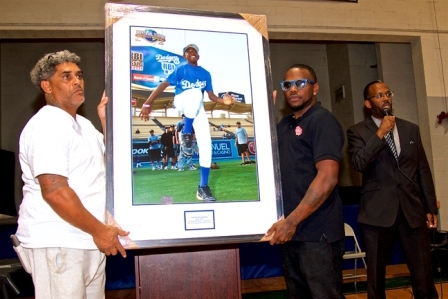 Black also shared with the grateful audience a commemorative photograph of Deangelo in his Dodger uniform; he also revealed the City Council’s plan to request that Los Angeles Recreation and Parks rename Diamond 4 in Deangelo’s name. Deangelo’s high school friends spoke highly of him, and other peers sang or just shared fun stories to pay their last respects to their fallen friend. Older brother, Tony Parham delivered heartfelt words of reflection, and thanks Deangelo’s friends for being so supportive of him. “My little brother you were more than my brother, you were my friend,” he recited. “My little brother, my little brother, handsome cause you look like me, my little brother, when I lost you, I lost a part of me.” Antonio reflected, “he was a very talented person who had yet to reach his full potential. He made such an impact in his short time here and I wish I had a chance to talk to him one last time,” he said. After the memorial, Dee Dee’s Friends and family moved to take a group photo on Diamond 4, which will soon be named in Deangelo’s honor. “My brother’s heart was larger than his small body could handle. May you rest in heaven, your big brother,” said Antonio Chatmon.